Francisco Guillermo Ochoa Magaña (born July 13, 1985 in Guadalajara, Jalisco), nicknamed "Memo", is a Mexican football goalkeeper who currently plays for Club América in the Primera División de México. 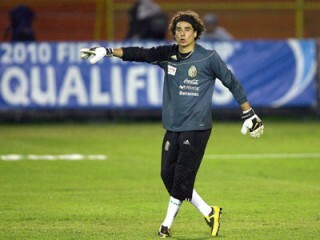 At the age of 18 years old, Ochoa made his debut with Club América, during the Clausura 2004 tournament against C.F. Monterrey. Ochoa quickly demonstrated his skill and talent as a goalie, and the young goalkeeper was thrust into the spotlight to replace injured veteran Adolfo Ríos. He would then share the starting job with Rios after he recovered from his aforementioned injury. When the Apertura 2004 season began, Ochoa was thought to be the heir apparent to Ríos, who had retired. However, new coach Oscar Ruggeri brought new goalkeepers with him, among them Argentine Sebastián Saja. Ruggeri's stay at the club was marred by controversy and unpopular decisions. He was fired after only six games into the season and Ochoa was soon reinstated by new coach Mario Carrillo. Since then, along with club and international teammate José Antonio Castro, he has started every game for Club América barring incidents involving injuries or national team duty. Under Carrillo, Ochoa won his first championship with América following the Clausura 2005 season. At the age of 20 Guillermo Ochoa was called up by Mexico's former manager Ricardo Lavolpe for the 2006 FIFA World Cup as the third choice , newly appointed manager Hugo Sánchez called Ochoa into the national side as a deputy to Mexico's then-number one, Oswaldo Sánchez. In addition to the World Cup, Ochoa has participated in the 2007 CONCACAF Gold Cup and the 2007 Copa América. He was voted the 11th best goalie in the world in 2008. He made his 2010 World Cup qualification debut on 28 March 2009 against Costa Rica. Ochoa kept a clean sheet as Mexico won the match 2-0 with goals from Omar Bravo and Pável Pardo. Another clean sheet soon followed against Guadalupe. Mexico manager Javier Aguirre selected Ochoa in his 2010 World Cup squad as first choice. View the full website biography of Guillermo Ochoa .